Just for clarification, even when you know the staff, GOING into your first operation, an ORIF (Open reduction & internal fixation), and a general anaesthetic is terrifying. However coming out… not so much! The day of the ORIF operation arrived, and to say I’d been climbing the walls whilst waiting would be a gross understatement!! I think I had looked at just about every possible outcome both of the operation, and my long term recovery. If you are reading this after having an elbow fracture, then I’m sure you’ll know EXACTLY what I’m talking about! So many questions, so much worry, and so few answers! In the GP surgery, when a patient, with no previous experience in a medical problem, has Googled a condition or comes in armed with a cutting from the Daily Mail, the consulation can be…. Challenging. A doctor who has extensively looked at EVERYTHING they can about their problem, I would imagine is, an order of magnitude, several times worse – thankfully my consultant was utterly amazing, and I now advise ANYONE with an upper limb problem in the Midlands to seek the services of Mr Stanislas if they can! For one thing, he and the team accepted the deluge of questions I released about the minutiae of fracture healing and rehabilitation very professionally, even if I may have been… wearing at times. Going forwards, I think I will have a lot more compassion for a particular subset of my patients. However, the patient quoting “Daily Paper X said, routinely used drug Y cures disease Z” will always be slightly… frustrating. So, there are my feet, chilled and waiting to be wheeled across the hospital to Day Theatre. 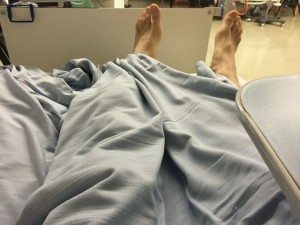 After I had spent seven hours sitting on the ward waiting for the ORIF operation, by the time I was in the the anaesthetic room, I had worked myself up into a right tizzy. Whilst I may have personally knocked people out before operations before… I’ve never even been unconscious… and so calmly explained to my consultant I was…. UNSPEAKABLY terrified… but that I trusted him completely. Thankfully that feeling of horror didn’t last long as the anaesthetist did her bit, and I was shortly put to sleep – well anaesthetised, anyway – white stuff in and eye lids down! General anaesthetic is weird. A lot of it is just bucket chemistry – pour it in and wait for the result. Now, whilst I have anaesthetised people before, being on the other end of the syringe and gas is… a whole other ball game. I remember thinking to myself, “Ok. Well, this is odd, I’m not even remotely sleepy”… Then I was waking up in the recovery bay!! There was no drowsiness, no sleepy sensations, heavy eye lids, none of that stuff. I was there, and then next moment I was somewhere else! Not a word of an exaggeration, this is the best way of showing what I woke up to. 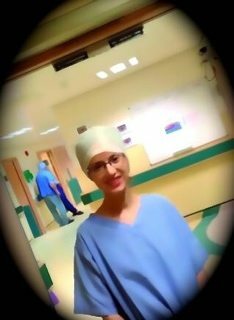 I saw the surgeon, in white Wellington boots and scrubs, walking towards me across the recovery room. Everything was encircled in black around the edges, and my eyes were literally bouncing around inside by head from one side to the other – I imagine it looked a little odd – esp as I couldn’t actually look at one thing. Thoroughly bizarre! In the operation I was given an ulnar nerve block, which meant that my pain was VERY well controlled during the following night in hospital – Which is lucky, as you can see from the X-ray below, I now have a good deal of metalwork in my arm – and this is the point where the name TitaniumGeek came into my head, and the thoughts of writing about my experience began to form! During the ORIF operation, I required intravenous antibiotics, as if metalwork gets an infection in the postoperative period is a tricky thing to treat. So I was given essentially medical “Domestos” to ensure there would be no infections.This also meant being to be woken at 3am, for more antibiotics to be injected into my veins. Seriously, metalwork infections are bad news, and they go a long way to stop them in the first place. I’m pleased to say – and also to reassure anyone else – I wasn’t awake due to pain because of the amazing nerve block in my arm – it’s like having an injection at the dentist, but rather than numbing your jaw, your entire arm goes numb. So much so that you can’t even move your fingers, which after the op will look a little fatter than you might recognise! Over the next 18hrs, I found the ability to move my fingers was a good indicator for the block wearing off. As the ulna nerve block, which controls sensation over the Little, Ring and half the Middle finger, wore off, the fingers became INCREDIBLY itchy, and also slowly began to move again. 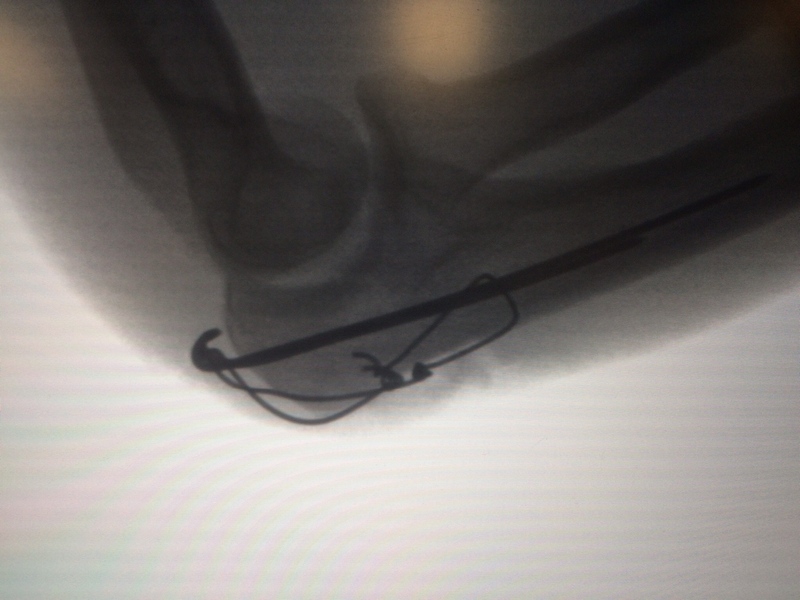 Things carried on pretty well UNTIL the nerve block completely wore off above the elbow. Then I was acutely aware that I now had two titanium rods nailed LENGTHWAYS inside one of my bones, and a tangle of wires at the tip of my elbow now holding me together! “Nurse, I don’t want to be a pain in the neck, and I appreciate that you are busy, but if you could spare a moment, shortly, to bring me the next dose of pain killers – I’LL BE IN YOUR DEBT FOR EVER AND EVER! PLEASE!! And thank you!! At no point have I ever claimed NOT to be a wimp! If you are about to go through a similar operation, I have only two tips, trust the surgical team, and be politely open when you recover. If you are in pain tell someone. You are actually more likely to be rude and snap at someone if you try to “brave it out”.